Well, 2013 is here and believe me when I say it's shaping up to be a mighty year, music wise. There's loads of new labels and bands shooting up all over the place and this post feature one of each. Corrupt Moral Altar are one of the newest bands to come out of Liverpool, which seems to be putting itself firmly on the metal map right now. They play a fusion of grind, sludge and metal. They will be releasing an EP called "Luciferian Deathcult" in 2013 through new label Baitin The Trap Records, which is run by Rick from fellow Liverpudlian sludgers Iron Witch. Needle Drugs is their three track demo, which was released at the back end of last year. Opener Stray Dog/Power Whore harks back to days of Scum ear Napalm Death and the like, except this song airs more on the sludgy side of things. It's full of thick riffs, blasting drums and high-pitched screams. CxMxA switch between nuts grind and mid-paced, tar-thick sludge while constantly keeping their guitars in overdrive. This could well be the longest PV song you'll hear, ever! The other two songs on Needle Drugs are equally in your face, but fly past your ears. Their ability to break up the battering with quality slower sections keeps you glued to the spot, as they rip you to shreds using only your speakers. Politics Is A Bargain Between Beggars and You Don't Have To Go To Clown College rip. There's more urgency amongst them, but CxMxA don't lose any of their thick, claustrophobic atmosphere. 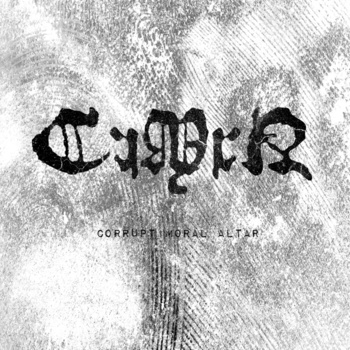 Corrupt Moral Altar are on Facebook at http://www.facebook.com/CorruptMoralAltar. Kepp checking for news on their debut EP and live date. Pre-orders for Luciferian Deathcult will be going up soon, so keep an eye on Baitin The Trap Records at http://www.facebook.com/baitinthetraprecords.